Venturi injectors are a highly efficient means of mixing liquids or gasses into a stream of water. They work on the principle of differential pressure. Water enters the venturi at a higher pressure than it exits. The difference in the entry and exit pressures creates a vacuum at the suction port on the side of the venturi. The bigger the difference, the greater the vacuum and therefore the efficiency of the mixing. Increasing the back pressure on the outlet side of a Venturi decreases the Suction as this reduces the difference in pressure between the Inlet and the Outlet. For example: If the back pressure on a Venturi is close to Zero (ie. the water flowing out of the Venturi goes straight into the top of a tank) then the Venturi will give maximum suction. Alternatively if the water exiting the Venturi still has to travel say 10 metres uphill then there will be 1 Bar back pressure. This will reduce the available suction. The Venturi tables allow us to calculate how much suction a venturi will generate under varying conditions. Each model Venturi has a corresponding performance table. These are available from the Wassertec website. The excerpt above is from a Model 784 venturi and is for Air Suction. If you are dosing a liquid then use the table marked “Liquid Suction”. Example. 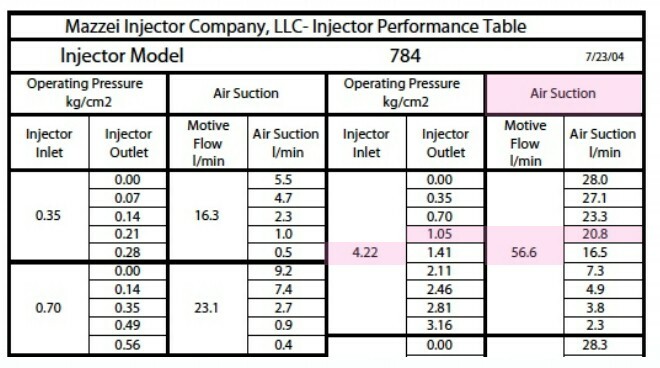 (Highlighted in Pink) With 4.22 Bar (kg/cm2) inlet pressure and 1.05 Bar outlet pressure (ie. 10 metre head of water) the Model 784 venturi will allow 56.6 litres of water through and create a suction of 20.8 litres per minute of air/gas/ozone. Contact Wassertec for more information concerning Venturi Injectors / Venturi Aerators – Wassertec are agents for Mazzei Injectors, which are made in the USA. Mazzei venturi injectors are engineered from highly chemically resistant Kynar (PVDF) and are available in sizes ranging from ½ inch to 12 inch pipe diameter. We keep stock of models in the ½ inch to 3 inch range. Other sizes are available on request.